REGALINE ALL MODELS INCLUDE STAINLESS STEEL LEGS  & BULLET FEET SPEC-LINE ”94” Series • 14 ga. 304 Stainless Steel • Stainless Steel Adjustable Cross Bracing on Front & Rear; Welded On Sides • 16 ga. 304 Stainless Steel Legs & Bullet Feet • 11” Backsplash • 14” Deep Sink Bowls Deep Drawn Bowls Are Seamless And Drawn Out of a Single Sheet of Steel Features and Benefits • 3” Large Radius Corners • Easy to Clean • Satin Finish • No Welded Seams SUPERSAVER ”9” Series • 18 ga. 304 Stainless Steel • Stainless Steel Welded Side Cross Bracing • Stainless Steel Legs and Bullet Feet • 8” Backsplash • 12” Deep Sink Bowls Deep Drawn Sinks       94 Series Shown Bowl Size 16” x 20” 20” x 20” 18” x 24” 24” x 24” 20” x 28” O.A. Length 25” 44” 62” *81” 29” 52” 74” *97” 27” 48” 68” 89” 33” 60” *86” *113” 29” 52” 74” *97” # of Comp. One Two Three Four One Two Three Four One Two Three Four One Two Three Four One Two Three Four Spec-Line 94 Series Approx. Standard 93 Series Approx. Super Saver 9 Series Approx. 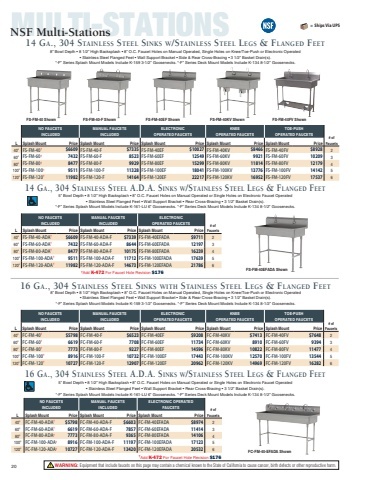 STANDARD ”93” Series • 16 ga. 304 Stainless Steel • Stainless Steel Welded Side Cross Bracing • Stainless Steel Legs and Bullet Feet • 8” Backsplash • 12” Deep Sink Bowls   ONE, TwO, ThREE ANd FOuR COmpARTmENTS with No Drainboards      14 Ga. 304 S/S 14” Water Level 16 Ga. 304 S/S 12” Water Level 18 Ga. 304 S/S 12” Water Level Model # Price Wt. (lbs.) Model # Price Wt. (lbs.) Model # Price Wt. (lbs.) Cu. Ft. 20 20 28 44 20 23 44 56 24 26 36 56 23 31 56 74 27 45 65 78       94-1-24 94-2-36 94-3-54 94-4-72 $3510 77 4554 109 5628 142 7195 225   93-1-24 93-2-36 93-3-54 93-4-72 $2281 62 3127 76 3958 107 5118 176   9-1-24 9-2-36 9-3-54 9-4-72 $2092 54 2866 66 3629 95 4697 155    94-21-20 94-22-40 94-23-60 94-24-80 3834 92 5000 116 6437 232 8090 285   93-21-20 93-22-40 93-23-60 93-24-80 2486 80 3440 92 4561 188 5826 210   9-21-20 2449 61 9-22-40 3154 79 9-23-60 4180 169 9-24-80 5358 192    94-61-18 94-62-36 94-63-54 94-64-72 3988 95 5114 165 6513 249 8118 312   93-61-18 93-62-36 93-63-54 93-64-72 2673 84 3601 144 4687 203 5916 264   9-61-18 2469 78 9-62-36 3326 132 9-63-54 4319 188 9-64-72 5465 255    94-41-24 94-42-48 94-43-72 94-44-96 4108 97 5944 174 7488 252 9307 347    93-41-24 93-42-48 93-43-72 93-44-96 2881 85 4341 145 5684 213 7294 302    9-41-24 2643 80 9-42-48 3981 133 9-43-72 5213 200 9-44-96 6684 281               20 * Requires Two Faucets Weights and Cubes are approximate See pages 29 and 30 for faucets, accessories, and modifications. 94-81-20 4528 94-82-40 5958 94-83-60 7713 94-84-80 9843 134 176 255 345 93-81-20 2998 93-82-40 4404 93-83-60 5878 93-84-80 7601 94 150 225 310 9-81-20 2740 9-82-40 4035 9-83-60 5388 9-84-80 6959 82 138 216 287 THE ONLY 14 GAUGE Deep Drawn SINK!